It’s February 1st, 2016 , and I’ve had this blog post saved as a draft for almost a month. It doesn’t make much sense to post about the “New Year” one month into it, but I’m going to share anyways. I think after reading this you’ll see that it would actually be rather hypocritical for me to not post it. I’ve never been one for New Years Resolutions. Mostly because I’ve never been good at making commitments and sticking to them. I’ve been really good at subtly saying “no” for a very long time. But the past two months or so leading up to January 1st, the theme of “Yes” had been showing up everywhere in my life. And when I was standing in the last few moments of 2015, I was standing in a room with 16,000 people, singing “Yes” to Jesus – literally. We rang in the new year singing “Yes” as our anthem song. A loud, thunderous anthem song that I don’t think I could have contained if I tried. So I’m not one for New Years Resolutions, but it has been confirmed by many reliable sources (mainly Jesus) that for me, 2016 is the Year of Yes. I’ll tell you exactly what I mean, but first I want to tell you that this loud call by God started with such a quiet whisper that I almost missed it. The first time that Jesus whispered the theme of saying yes was when I was in Peru. During the time there was a strike going on in the city we were living, and our days consisted of a lot of Dutch Blitz, and a lot of reading. On this particular day, I was reading the Bible. And it was really, really hot that day. So hot that it was actually hard to focus on the words I was reading. But then, the words jumped off the page and smacked me right out of my heat trance. For Jesus Christ, the Son of God, does not waver between “Yes” and “No.” He is the one whom Silas, Timothy, and I preached to you, and as God’s ultimate “Yes,” he always does what he says. God said “Yes” through Jesus Christ. This is so amazing to me, and as soon as I read it I knew there was so much power behind it. And the power of the word “yes” was whispered by a loving God who says “yes” to me daily. And then, the moment was over and I didn’t think of that verse again. Everything within me was bursting with excitement, and my heart was so in agreeance with this message. “Yes” to relationship with the God of the universe. “Yes” to a partnership with God. God said “YES” to a relationship with me. Someone so undeserving of his love. But he said “yes” anyways and sent Jesus to die for me so that I could have this connection with Him. A connection there was no way to obtain without His son. God said yes to me. But not just to me. He is saying yes to us all. He wants us all to accept that resounding “YES” from him and start a journey with Him. He wants me to enjoy that “Yes”, but he also wants me to share that yes. I didn’t earn it. It’s not only mine. It’s yours too. It belongs to everyone. So, on that last night of Urbana, I said “yes” to “saying yes”. And frankly, I didn’t really know what that meant. It scared me a little bit, because if God has to remind me to say yes — what on earth could he possibly be going to ask me? Maybe something that scares me. Maybe something I think I can’t do. Maybe something I really don’t want to do. I’ve made the commitment to say “yes” to whatever it is. Hearing someone even say the word “yes” in any context, caused chills down my spine. There is so much power and victory in that word. I believe that God will use the word “yes” over and over in my life. Because now that it has resonated in me, I don’t think it will ever stop. Maybe God will ask me to do something big this year, something out of my comfort zone. But I also think he wants me to say “yes” to the little things that are out of my comfort zone just as much as he does the big, maybe even more. For a long time, I’ve been really good at making my no’s sound like yeses. For the sake of my own comfort, I’ve said no to many things (and people) without ever flinching. But Jesus is calling me to really say “yes” to the things he places before me. Saying yes to the opportunities to serve. Saying yes to a more intentional relationship with Jesus. Saying yes to learning and growing. Saying yes to a fuller prayer life. Saying yes to being thankful. Saying yes to loving the people around me. The people who, in my heart, I’ve stamped a big “no” on. Which I 100% have – But Jesus said yes to them too, with joy. Saying yes to sharing things that are hard to share. Saying yes to vulnerability. Saying yes to listening, really listening. Saying yes when I am afraid. Maybe some of these are things you feel God is calling you to do this year also. Maybe you’ve said no to people and situations in your life that you know Jesus wants you to say yes to. Maybe you’ve neglected to love the people God himself has said yes to. 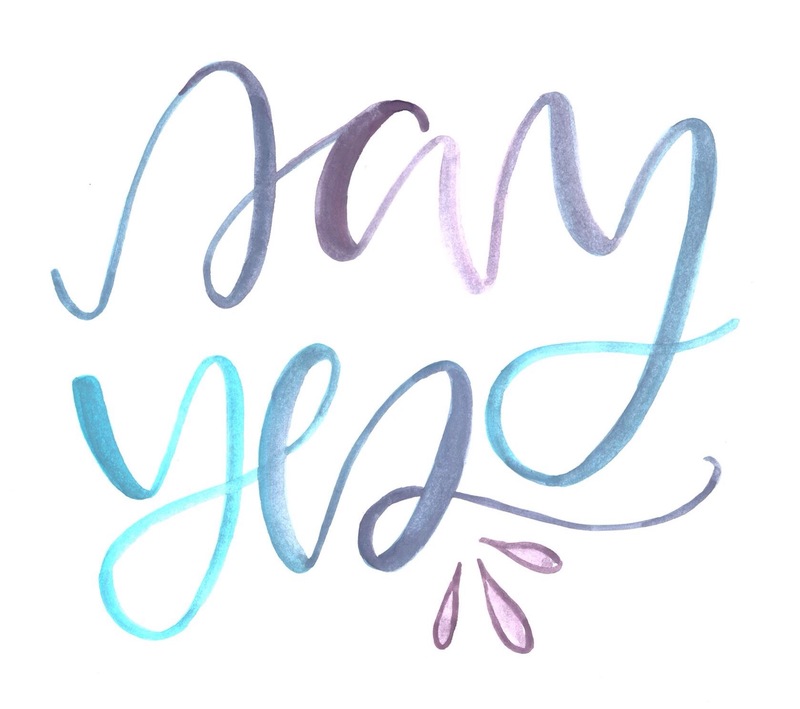 Maybe 2016 can be the year of yes for you, too. I think we could all use a little bit more of the word “yes”. So, it’s official. For me, 2016 is the “Year of Yes”. It’s February 1st and this post has sat unpublished for nearly an entire month, because I am afraid of posting it. The fact that I am afraid of posting this is the very reason why I am posting it. This post is one of the very small ways I am saying “yes”. I’m excited and nervous to see how else I will say yes this year. My prayer is that saying “yes” would become habitual in my life, because God gave me the BIGGEST yes someone can give. So I’m diving in to the Year of Yes And praying that it might become the lifetime of yes. 2016 is the Year of YES.